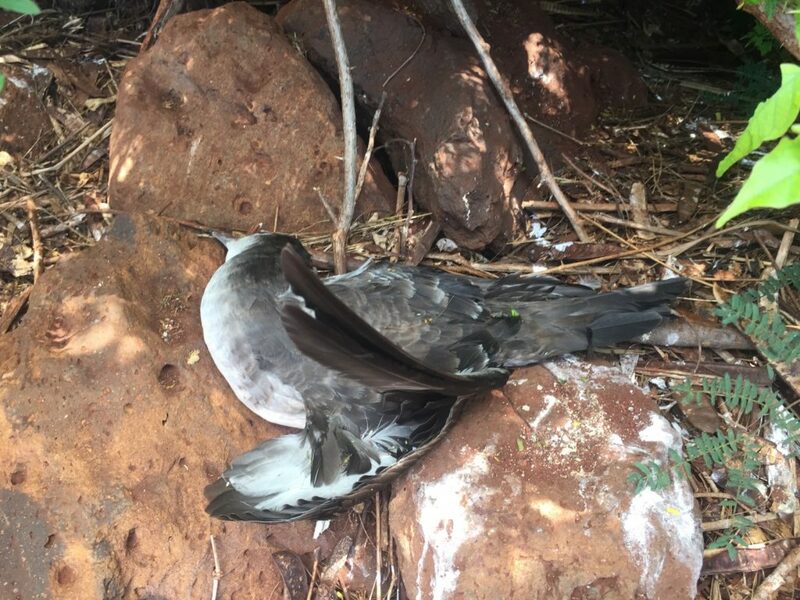 LIHUE, KAUAI — On Sunday May 22 and continuing today, State wildlife officials on Kauai are responding to the discovery of 34 dead Wedge-tailed shearwaters in the seabird colony at Spouting Horn, Lawai area on the south coast. Most of the kills were found near the parking lot end of Lawai road. Department of Land and Natural Resources Division of Forestry and Wildlife (DOFAW) biologists say evidence so far points to dogs as killers of these native seabirds, which are ground-nesters. Unfortunately this is not the first time seabirds have been killed in this way. The bird carcasses have been taken to the DOFAW baseyard in Lihue and will be autopsied as soon as possible to confirm how they were killed, which indicates the likely predator. “Unfortunately though, unless someone saw the attack and identifies the dog it is very difficult to definitively prove. This is why we need more citizen monitors to help us protect and care for these vulnerable birds in their habitat,” Kaiakapu said. Wildlife managers are meeting with Kauai Division of Conservation and Resources Enforcement (DOCARE) on how to address this situation and prevent future recurrences. Anyone who may have witnessed the attacks over the weekend is asked to contact DLNR DOCARE at 643-DLNR with descriptions of any dogs observed in the seabird colony.